Matthew Stafford carries a reputation for not being athletic. It isn't true. He does have good straight line speed. He ran a 4.81 40-yard dash at the scouting combine. It was third-fastest among QBs that year. Yet, he has never been a very good runner. Actually, when he was a rookie, he seemed uncomfortable running the football. It just hasn't been a part of what he is expected to do going back to high school. I think it was one of the reasons he got injured early in his career. One of the times was on a relatively routine tackle, while he was scrambling. But as time has moved on, Stafford has developed better pocket presence and he can make a defensive lineman or linebacker miss in space. It was the key on his 67-yard TD strike to Calvin Johnson to open the scoring. He also moved well on the Lions' second TD, as well. 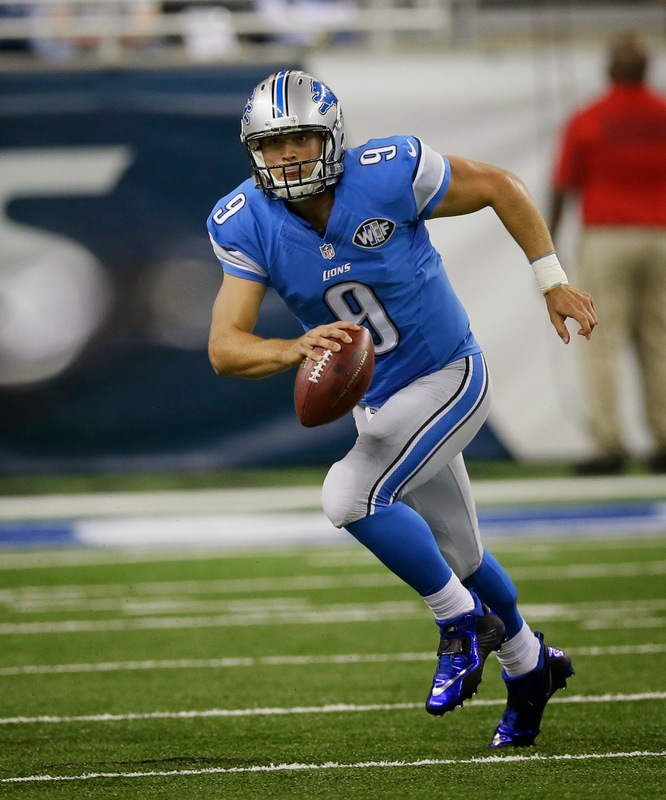 To say the least, Stafford displayed excellent athleticism on both plays. - Horrible penalty by the Lions to end the quarter. - Johnson has been remarkably open in the first quarter of this game. I think it has a lot to do with the number of different personnel groups the Lions are deploying. I know the Giants' defense expected it given new Lions' offensive coordinator Joe Lombardi's background with the Saints (they run a zillions personal groups), but it has still put them more back on their heels. - The Lions' secondary is already depleted. Safeties James Ihedigbo and Don Carey didn't dress. Cornerback Bill Bentley injured his knee during the first quarter. It is alarming. Defensive back is obviously the Lions' biggest weakness and their least position of depth. I don't think the Lions really wanted rookie fourth-round pick Nevin Lawson on the field this quickly. - Quarterback Eli Manning looked extremely uncomfortable in the Giants new West Coast Offense during the preseason. He still does. It wasn't until the Giants' went into their hurry-up offense that Manning got untracked. - Big sack by George Johnson. Maybe the Lions have really found something in this kid. He was the surprise of the preseason.